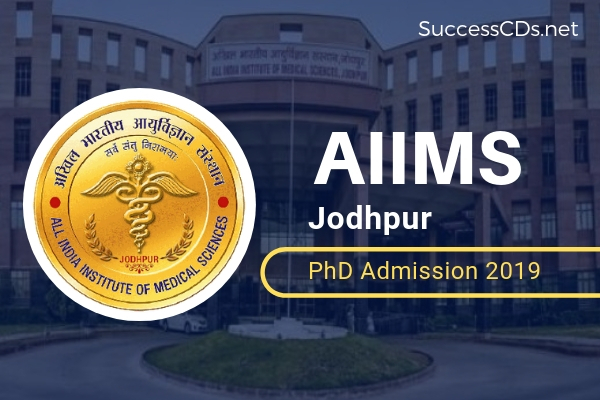 All India Institute of Medical Sciences (AIIMS), Jodhpur, conducts Doctor of Philosophy (PhD). The minimum period of registration in respect of all the candidates who are registered for PhD shall be three years and maximum period of registration shall not exceed five years. A degree of Master of Science in Bio-Medical Sciences or Laboratory Medicine with at least 60% marks. A degree of Master of Surgery or Doctor of Medicine or MDS or an equivalent degree or Diplomat of the National Board of Examinations. A degree of Bachelor of Medicine and Bachelor of Surgery (MBBS) or BDS with a minimum of 55% of the aggregate marks in the professional examinations. Note: Candidates working under the Central Govt. /Semi Govt. /Autonomous organization should submit their application through proper channel i.e. through the employer. A ‘No Objection Certificate’ is mandatory from their employer before joining the PhD Program. Candidates should be employed in extramurally funded project sanctioned to the Guide or Co-Guide of AIIMS, Jodhpur. The project funds should be sanctioned to the AIIMS, Jodhpur. All application are required to visit website regularly since all subsequent Corrigendum/Addendum/Updates will be uploaded on the website only.